As part of their animation portfolios submitted to Sheridan or Seneca's animation programs, students need to include 2 room drawings. 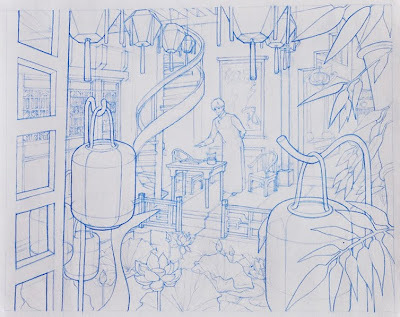 One drawing must show the room (drawn using perspective), all of the furniture and objects within the room, and a character. 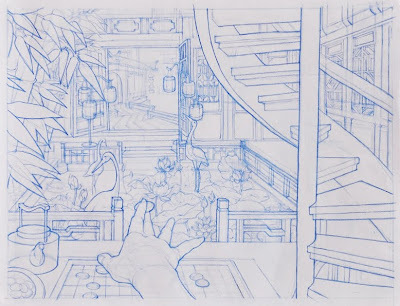 The second drawing of the same room, should be drawn from the point of view of the character in the first drawing. The exercise shows a student's ability to draw an interior environment from two different angles and maintain a sense of spatial volume and consistent proportions of various objects/furniture in the room. Here is an example of 2 very intricate room drawings by APW student Elsie Zheng. Elsie applied to Sheridan and recieved an offer of admission for September 2011. See more of Elsie's drawings.